April is always a brighter month for my inbox. Each day, Knopf Poetry sends out a free poem from a diverse roster of writers including Marge Piercy, Mark Strand, Edna St. Vincent Millay and Edward Hirsch. 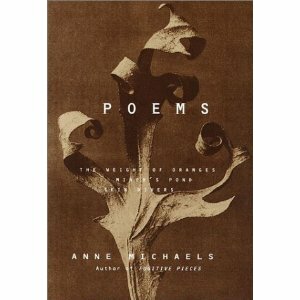 It’s Knopf’s way of celebrating National Poetry Month and bringing some well-deserved attention to the genre. The program also offers bonus features such as downloadable broadsides, audio clips and signed books. This beauty by Anne Michaels arrived one April morning last year — right next to the cell phone bill and news of a Dutch lottery jackpot — and took my breath away. Hope it fuels your creative fires, too. posted 9 Apr 10 in: art, books. This post currently has no responses.